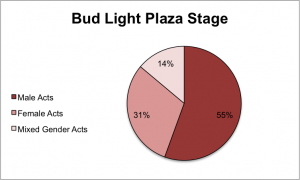 Here’s a fun fact for all your CMA Fest attendees: two out of four nights at LP Field (the main stage) had no female or mixed gender acts. In light of the controversy surrounding Keith Hill’s comments on playing female artists at country radio, you can’t help but question if the ratio he suggests reflects the genre’s demographic itself or just an outdated mindset. 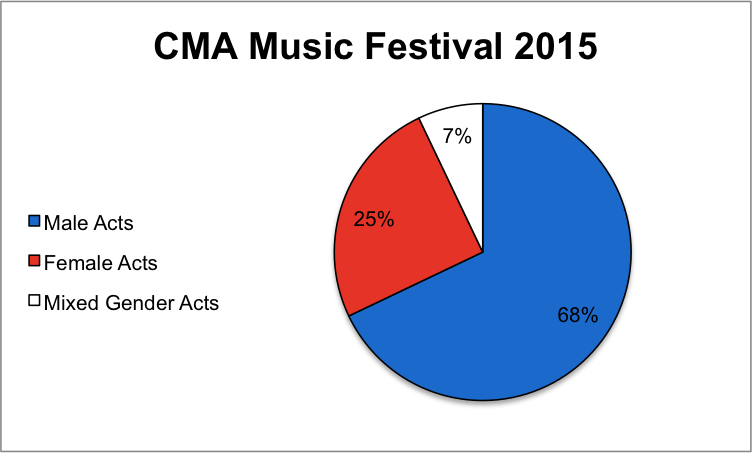 CMA Music Festival reads like a who’s-who in country music. If you’re not there, do you even belong in country? There are obvious exceptions to this (this year, Blake Shelton and Miranda Lambert were notably absent, and Kacey Musgraves played at Bonnaroo instead), but for the most part, country artists of all levels of success are expected to be there. We decided to take a look at this year’s line-up to see where women stand in country music as a whole. 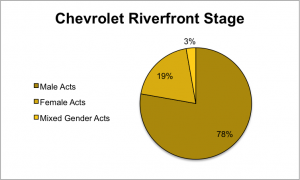 Even though LP Field had two whole nights without a female or mixed gender act, they still had a lower percentage of male acts (75%) than the Chevrolet Riverfront Stage (78%), the second-biggest stage at the festival. At that stage, 28 out of 36 acts were male. 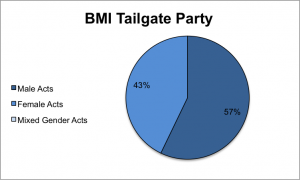 The stage with the highest percentage female acts was the BMI Tailgate Party at 43% (there were no mixed gender acts), which took place outside of LP Field before the main show began. It’s worth noting that DJ DU, a male act, performed multiple times over all four days at that stage, but was only included once in the total male acts. The Bud Light Plaza Stage and the Belk Park Stage both had five mixed gender acts perform. 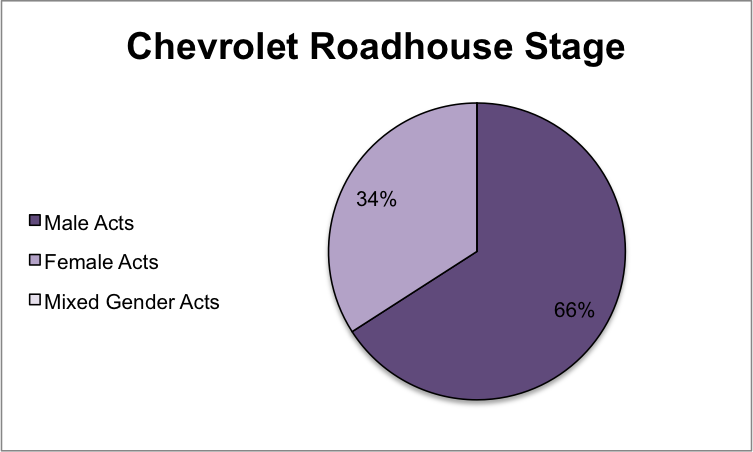 Two stages (BMI Tailgate Party and Chevrolet Roadhouse Stage) had none. The charts show us a lot. 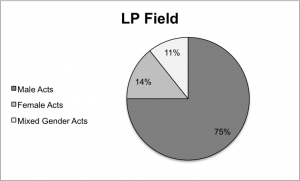 Hill says that country radio stations don’t play more than 19% female records, and if we use the CMA Fest line-up as a way to see how many females are actually putting out music in the genre, 25% is off, but not by all that much. This may show a deeper issue in country music as a whole. 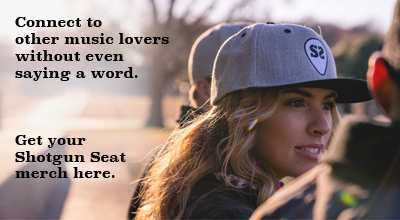 What if it isn’t just country radio, but country music in general, that gives women fewer opportunities to succeed? Crunching numbers can only tell you so much. That being said, there is clearly a problem here, and that problem must be fixed. 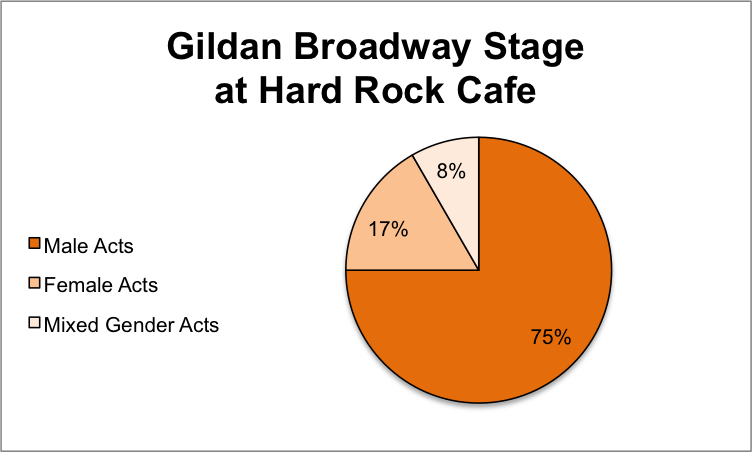 Check out the stage-specific charts below.